Memories make the heart grow fonder! The Landlocked Oyster Fest & Benefit by Oyster South last October was an inaugural shellebration that I could not miss. When so many of the South's top oyster farmers and chefs come together under one roof, you know good things are bound to happen. The aroma of ocean brine, yeasty bubbles, and mouthwatering BBQ permeated Color Wheel Studios, a creative camp for kids that's been temporarily remade into a foodie's playground. We were just down the street from Kimball House, one of the top oyster bars in the country and based in Decatur, GA, a city just Northeast of Atlanta. 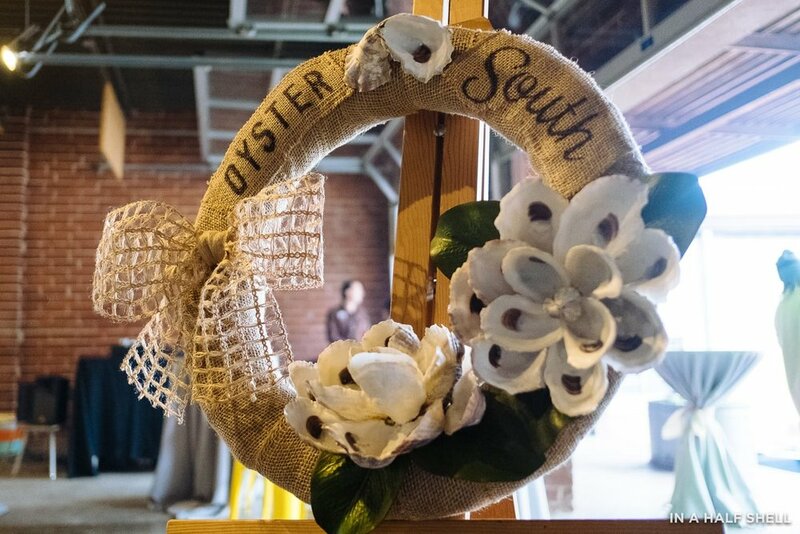 Landlocked Oyster Festival & Fundraiser is a signature event of Oyster South, a non-profit organization dedicated to encouraging oyster farming and consumption across the south. I flew down from NYC the day prior to partake in the festivities and support my friends. In case you're still on the fence about attending this year's festival (which you really shouldn't be), here's a quick recap that might help tip the scale. This was truly a kid in a candy store moment. I slowly circulated around the oyster room where over 20 different farms were setting up their shucking stations. I've encountered some of the names before, such as Murder Point, Cape Hatteras, and Cedar Island Selects, but many were surprisingly unfamiliar. It was a unique opportunity to discover new favorites. A few friends from the East Coast (Fishers Island, Island Creek) and West Coast (Hama Hama, Hog Island) also came into town to join the fun. Generally speaking, I gravitate towards the raw oyster selection at such tasting events. However... I found myself drawn to the smokey, buttery, salty, and spicy aromas from the cooking area outside. Fact: southern chefs take shellfish cookery to a whole other level. These decadent bites—without the usual caviar, quail eggs, or wasabi in sight—really captured my tastebuds and heart. Fried oyster sliders, clam & shrimp chowder, and even oyster-topped nigiri. It all worked! Speaking of deliciousness, I just received a copy of Irv Miller's Gulf Coast Oysters in the mail. It's a beautiful oyster cookbook that's also loaded with information about the emergence of boutique Gulf oysters. Just flip through it at your own risk—you will feel hungry. Who wouldn't want to hang out with some of the sweetest, funniest, and most amazing oyster lovers in the country? Landlocked draws in an amazing roster of oyster farmers, chefs, scientists, and oyster addicts like myself. I've got my flight down to Atlanta booked. Who's joining me?